These dogs are just too funny. 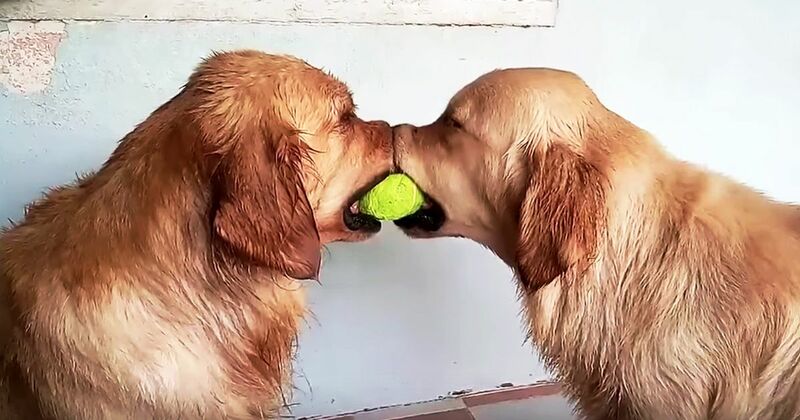 First, two Golden Retrievers are locked nose to nose, a gentle but persistent struggle to see who gets the precious tennis ball. What's their third buddy to do? Why, walk over and rest his head right on top of theirs! Almost as if he's saying, "Hey guys, let's just face hug until we all feel better." Too cute! Actually, fighting over toys is pretty common amongst dogs. These guys are pretty mellow about it, though it can sometimes get a bit more forceful than that. But why? Well, according to Lindsay Wood, Director of Animal Training & Behavior for the Humane Society of Boulder Valley, it's because of leftover instincts from when dogs weren't domesticated yet. It's referred to as "resource guarding," and dogs will most often get into it over food and toys. Back before they had humans taking care of their every need, they needed to make sure they had enough food to survive. We totally understand. What if that's the last tennis ball on earth? Also, there may be something else going on here. As their name would suggest, Golden Retrievers are exceptional at, you guessed it, retrieving things. Basically, as Animal Planet explains, they have a strong instinct to go get stuff and hold it in their mouth. Do you have a precious retriever at home that gets your stuff and just won't let go? What's the funniest thing they've retrieved for you? Let us know in the comments below! And be sure to share this with your friends so they can share their stories too.